Choose compact dwarf varieties like Alaska Variegated, Empress of India, Cherry Rose Jewel or Nasturtium Fiesta Blend for micro garden compact spaces like containers. Choose climbing or trailing nasturtium varieties with longer vines for vertical gardens, ground covers, weed barriers or living mulch. Varieties include White Moonlight, Red Canary Creeper, Multi-Colour Trailing Mix and Yellow Canarybird Creeper. 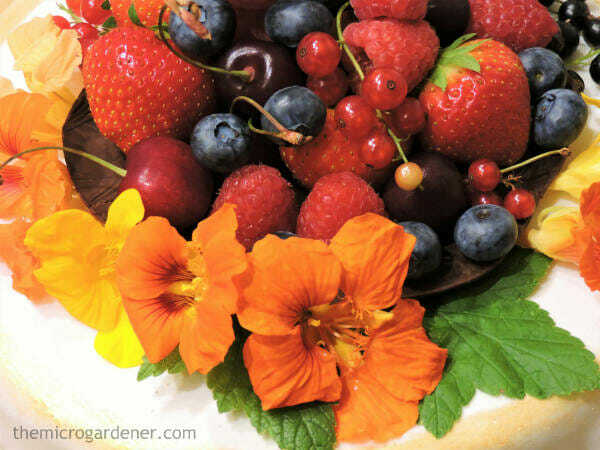 Sow organic and heirloom seeds in spring and summer if you get frost. If you live in a warm-hot climate, plant them anytime. Sow to a depth of twice the length of the seed (about 1.5cm or 1/2 an inch) as they need darkness to germinate. Keep moist so the seeds germinate. 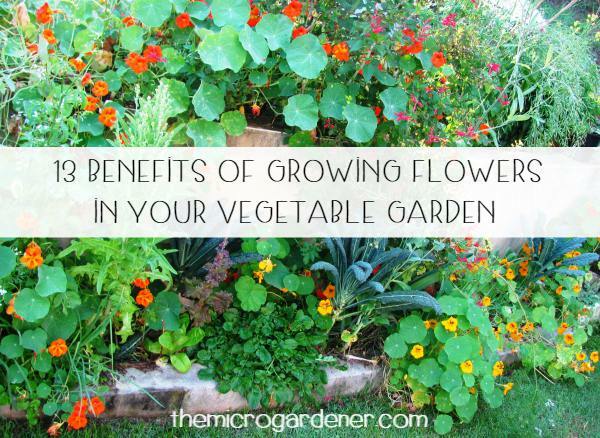 Once established, you’ll likely find they don’t require much water. Perfect for those with water restrictions or limited rainfall. They can take drought and heat although can suffer sunburn and heat stress in extremely hot weather. If you live in a climate where you get scorching summers, try planting in a pot and moving to a more protected spot or plant where they’ll get a bit of protective shade. 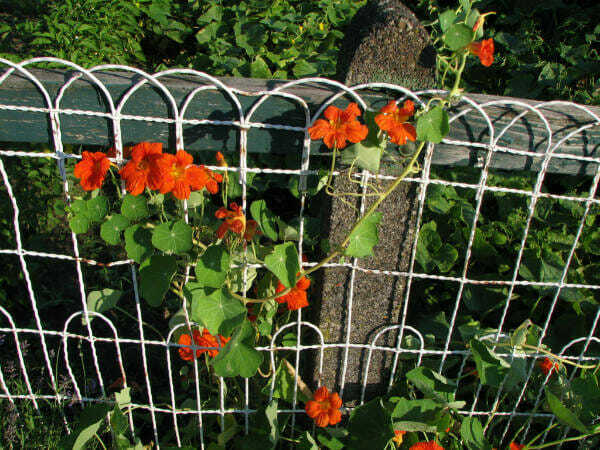 Nasturtiums tend not to tolerate frost. From my observations, they don’t like strong winds either. If they get a bit ratty looking, just prune them back and use the leaves and vines as mulch. They will quickly reshoot new growth! 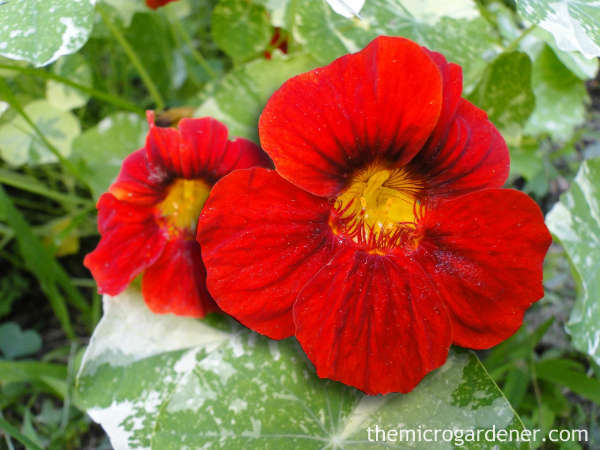 Grow very well in poor, dry soils so plant nasturtiums where other flowers and vegetables would be unsuccessful. Aren’t fussy about sun or semi-shade – do well in both. However, in the full heat of summer, nasturtiums can suffer heat stress. Adding shade protection or moving pots to a filtered light position will keep them happy. Can be trained to grow vertically or cascade down from hanging baskets and other containers depending on the cultivar. If you want an abundance of flowers, they prefer a dry soil with some humus content but if you want to grow them for their luxuriant leaves plant them in nutrient rich soil! If you don’t pick all the flowers, they will self-seed profusely and provide you with loads of free plants. Require very little care – if you have sufficient rainfall in the warmer months, you may not have to water at all. Encourage more flowers to grow and a more compact shape by pinching out the runners from time to time. Add a few cheerful blossoms to a vase. 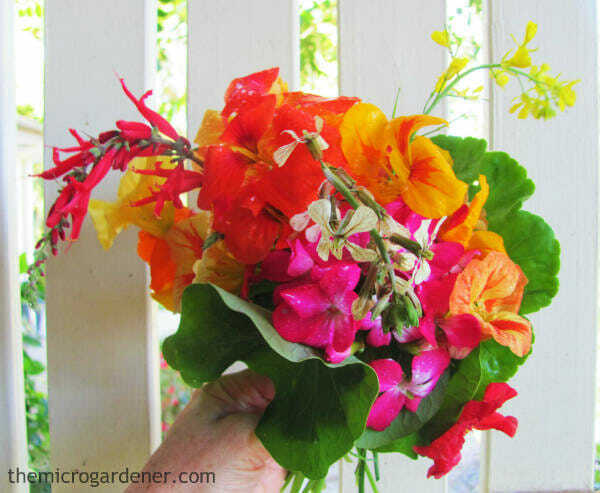 Nibble on these edible flowers while they brighten up your kitchen bench. The most familiar and commonly used part of the plant. The tender leaves have a slight peppery bite to them and are quite similar to watercress in flavour. I’ve found leaves store well in a sealed plastic bag in the refrigerator for 3-5 days. Nasturtiums are best when picked young and tender, in cool weather. The older the leaves are, the spicier the flavour. Nasturtiums are a tasty addition to all kinds of salads. You can slice leaves into strips. Their peppery flavour makes them an excellent rocket substitute. Use in risottos, soups, juices, casseroles, pesto and rice dishes. 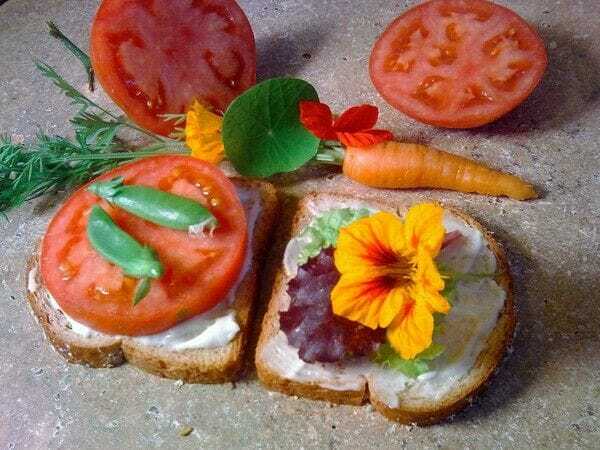 Get creative with nasturtiums and make your own sandwich art! Stuff and bake them as you would grape leaves. Try a mixture of rice, currants, nuts and savoury spices like cinnamon, mint and cloves. Use as a decorative base on a plate for serving appetizers (and a few flowers on the side as a garnish). Grind or mince the chopped leaves with salt, chillies and garlic until they form a paste. Use to flavour stir fries or other dishes. Tip: If leaves and flowers are chopped up finely and added to other greens and vegetables, the warmth in their flavour is not as noticeable. Pick blossoms the same day as using, as close as possible to serving time. Store in the refrigerator if eating or a vase to enjoy their beauty and fragrance. 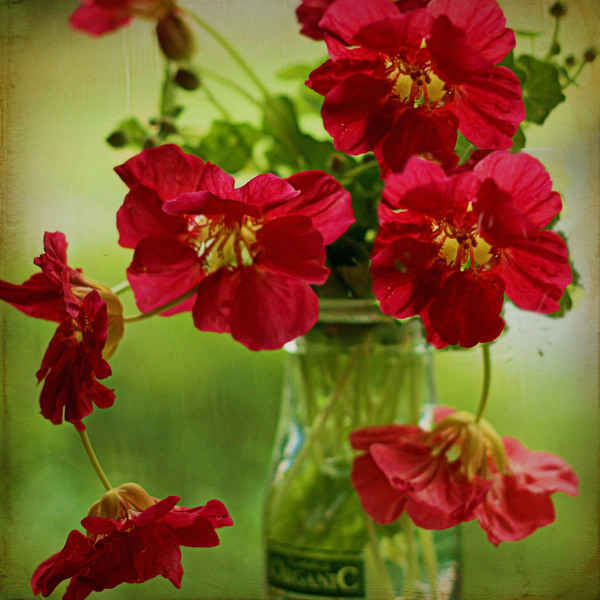 Nasturtium cut flowers last several days in a vase and make a pretty arrangement with other herb flowers. I often pick them with flowering edibles like the red pineapple sage blooms, yellow mustard, white rocket flowers and pretty pink geraniums. Organically grown flowers don’t harm you with any nasty chemicals when you inhale their fragrance. Nasturtium blossom vinegar – Add flowers & a few garlic cloves to white wine vinegar and allow the flavours to infuse for 6-8 weeks. A delicious addition to dressings. 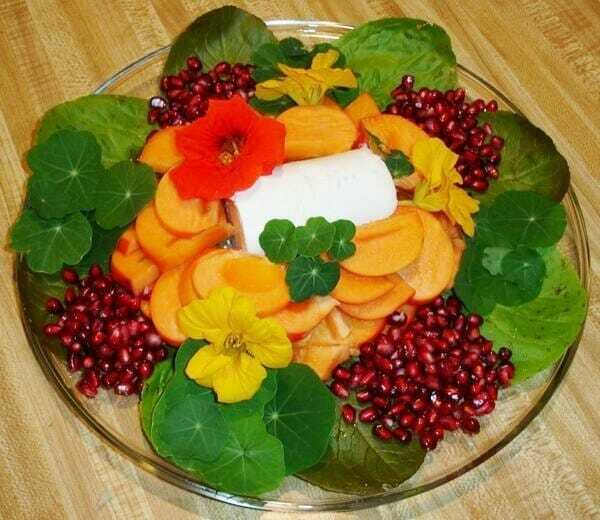 Try floating the edible colourful nasturtium flowers in your punch bowl or garnish a fruit salad. Make sure the buds are fully closed and leave a bit of the stem attached when picking and use fresh just as you would the leaves to add a peppery zip to dishes and salads. 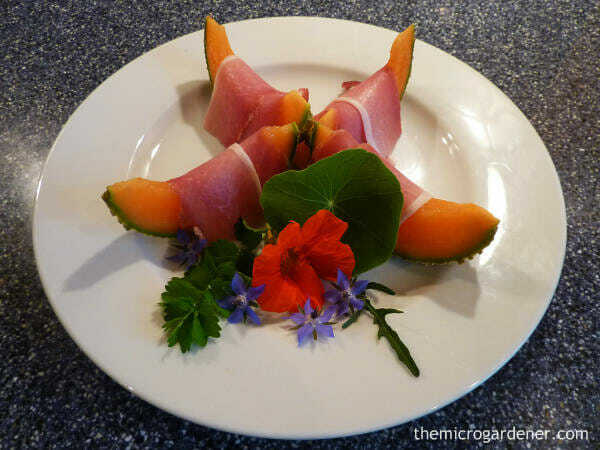 Nasturtium buds can be washed and added to salads or desserts. They have a sweet nectar inside. 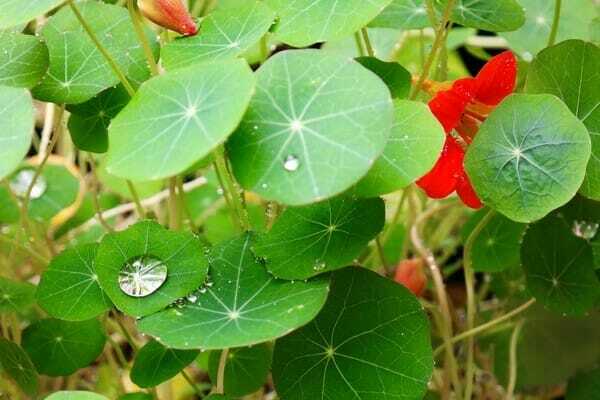 Nasturtium seeds can be harvested green, as soon as the flowers have fallen off (immature for eating). Or harvest when mature (brown) for seed saving after they have fallen from the plant. 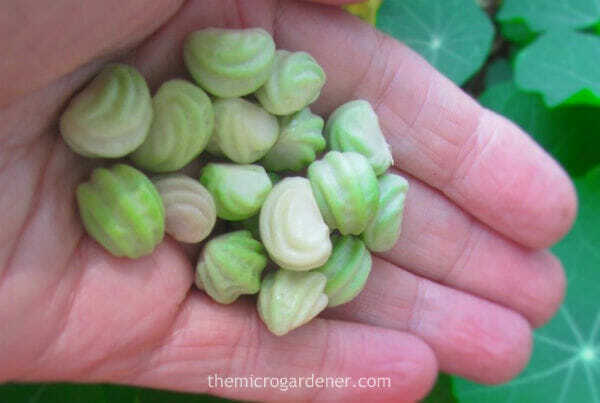 Nasturtium seeds – freshly picked green seeds and brown dried seeds ready to sow, save or eat. 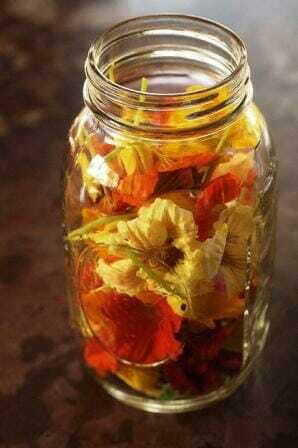 Nasturtium Pepper – MYO Seasoning! Lightly roast the mature brown dried seeds on an oven tray and then grind in your pepper grinder (or mortar & pestle). This is such an easy way to make your own home grown pepper! Use whole in place of peppercorns or crushed instead of pepper to season dishes and marinades. Nasturtium Capers – Collect flower buds while they are still tight heads. Harvest the unripe green seeds before they harden and fall to the ground. 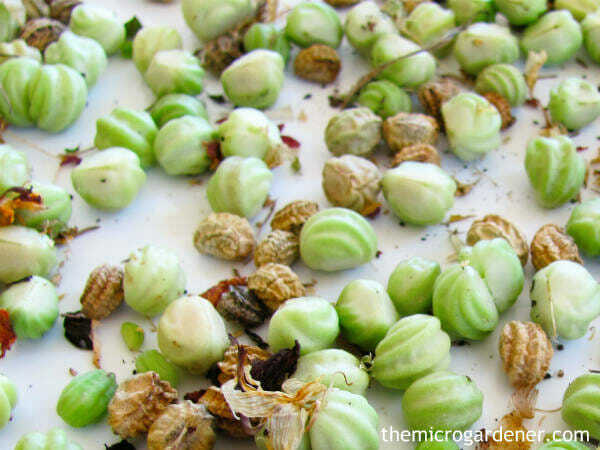 Nasturtium seeds have a similar taste and texture to capers so make a great substitute. They have a nutty taste and are crunchy addition to salads. They have a similar taste and texture to capers so make a great substitute. Wash and add buds and seed pods to a clean glass bottle. Add enough vinegar to cover and your pickled capers will be ready to eat in just three days! Use as a condiment with savoury dishes and fish. Keeps well for at least a year out of the fridge. Tip: Prick the seeds with a fork before adding the vinegar. This allows the flavour of the hot vinegar to permeate the density of the seeds and helps to preserve them. Nasturtium Butter: Chop up a good handful of nasturtium flowers and mix with softened butter. Depending on what flavours you like, try adding pepper, garlic, or onions. Chill in a chocolate mold or small glass serving dish. Great with fresh bread with its pretty confetti-like colours. Nasturtium Mayonnaise: A delicious accompaniment to fish. Just add chopped nasturtium flowers and/or leaves, a squeeze of lemon juice and some crushed garlic to your mayonnaise for a tasty alternative. 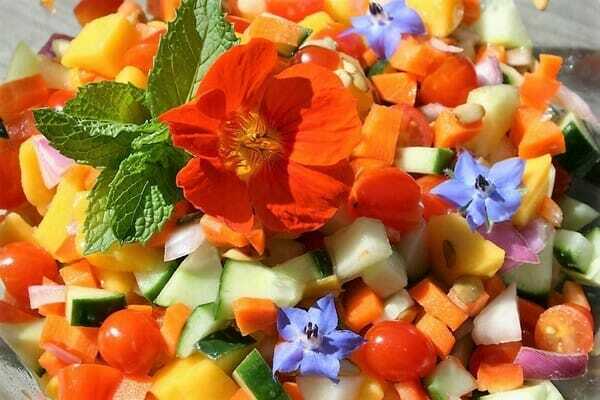 Red: 1 1/4 cups (or 1/2 pint) cherry tomatoes sliced in half; Orange: 1 large carrot and 1 orange capsicum (sweet pepper) diced; Yellow: 1 chopped mango; Green: 1 sliced cucumber, unpeeled and 1/4 honey dew melon chopped; Blue: handful of common blue borage flowers; Purple: 1/4 diced purple salad onion. Nasturtium Pesto: Learn how to make your own in this video. Nasturtium Capers: Learn how to pickle the seeds to make capers in this video. Well, I hope you’re learning to love these incredible herbs like I am! There are even more uses for nasturtiums including using them as a pest strategy for your garden – more about this in a future post! 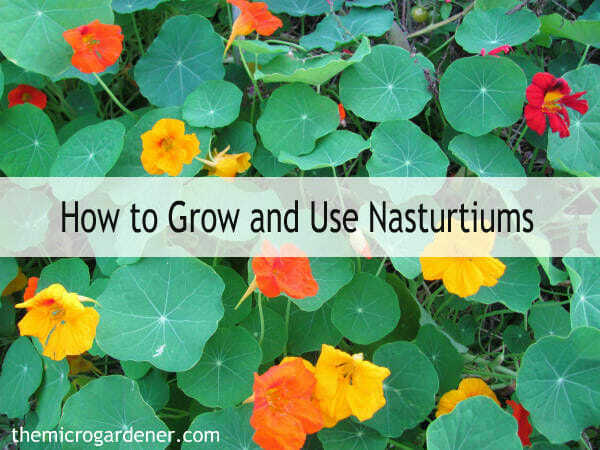 If you are already growing nasturtiums, how do you use them? I’d love you to share your experiences and find out if this information is useful to you. 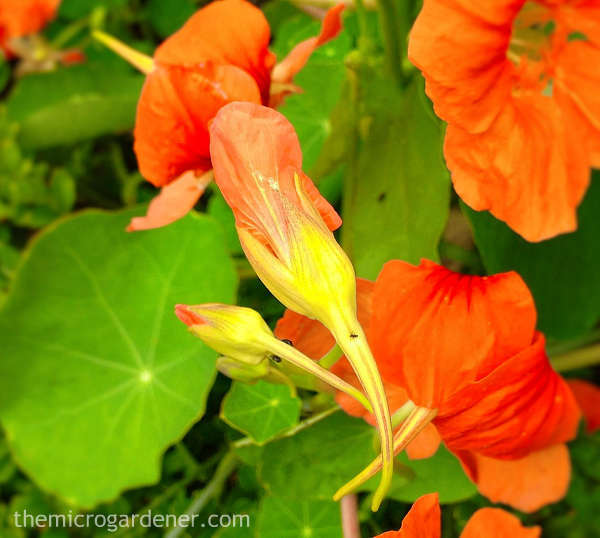 Tropaeolum Majus – learn to love them! 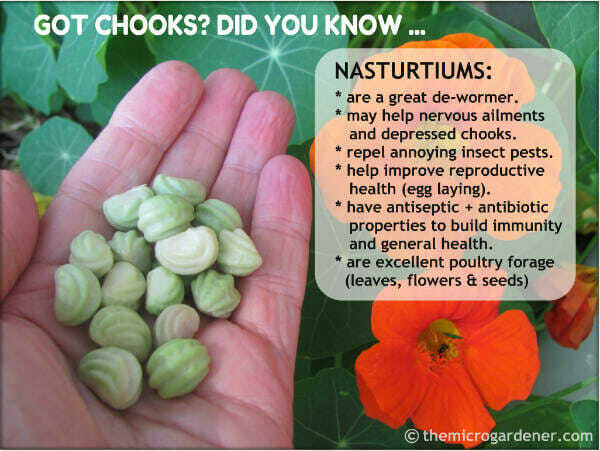 Interested to learn more about Nasturtiums? You may like 20 Reasons to Grow this Amazing Herb or grab yourself a copy of Isabell Shipard’s herb book or DVD course for a wealth of health giving information on edible herbs for your garden. Or check out the How to Grow articles for more inspiration. In your picture of green seeds in jars, there is some kind of clamp; what is that, and function, and where to find please? These are Fowler’s Vacola jars for preserving with the metal clamps to help seal and form a vacuum. Designs have changed over the years. 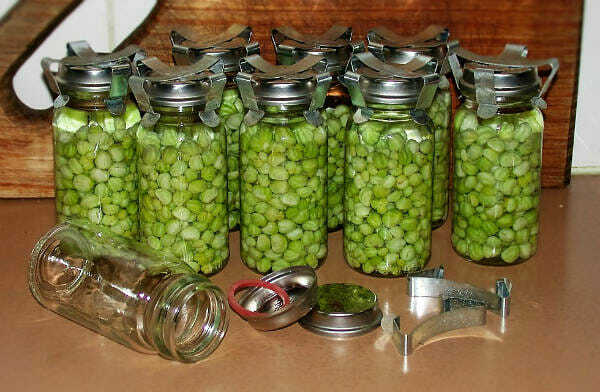 However, you can use any kind of canning or preserving jars that have an airtight seal. This is to ensure the food does not come in contact with air and can be stored for long periods. You can also use mason jars if you have access to these via Amazon. I have a very large planter box on the eastern side of the house in north Queensland, planted with nasturtiums, they are flowering beautifully but the leaves are starting to turn yellow, what do they need..the ones in a pot on the western side are lovely and green. Also, we have some growing up the very end of our driveway by a neighbours fence – what is the procedure for transplanting these to the garden – can they handle that? Caroline in my experience, nasturtiums can be fussy movers. They can be transplanted (although not all successfully sometimes) but will definitely fold their arms in protest and look like you’ve beaten them up for up to a week or more before finally agreeing reluctantly to get on with life in their new home! Some plants can handle moving house better than others. That said, if you need to transplant them rather than plant more from seed (which they produce copious amounts of), then I suggest watering them with seaweed the day before the move (helps prevent transplant shock) and preparing a better home for them to move to, so they actually rather prefer it to their old one! i.e. add some fresh nutrients, compost and seaweed and water in well so when they arrive it’s like you’ve said “Hey I’ve put on a special dinner for you to celebrate your new house! Tuck in.” This will help soften the blow and they’ll adapt much quicker and likely protest less! Also, only move them in cool weather i.e. very early morning and perhaps protect them from the heat of the sun with some shade cloth for a few days so they settle in. The soil will be different, the conditions will be different and anything you can do to help them adapt will help swing a successful move in your favour. Good luck. Last summer I grew nasturiums in a planter on my balcony. They never made it beyond the leaf stage as something was munching on the leaves until there was almost nothing left. My gardener friend thought it might be moths or slugs, but i did not see either. I’d like to try growing them again, but how can i prevent them from being eaten? The rest of my flowers and herbs were not in danger at all, only the nasturiums. 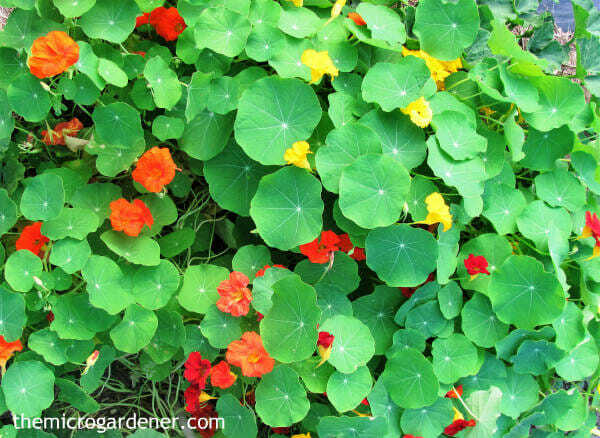 Nasturtiums are usually pretty resilient if they are well fed. The main predator insect that enjoys them as a snack in my experience is the caterpillar from Cabbage White Butterflies. They are usually camouflaged so well as they are the exact same colour as the leaves. You may have missed seeing the culprit despite it being right before your eyes if you didn’t know what to look for. It’s likely a mother Cabbage White butterfly (an imported pest by the way!) laid her eggs on your nasturtiums knowing her babies enjoy that food and went on her merry way. Keep an eye out for the tiny yellow eggs on the underside and smear them off if they appear. You can always stick an net onion bag over the top or a cloche until they are big enough to cope with a few nibbles. 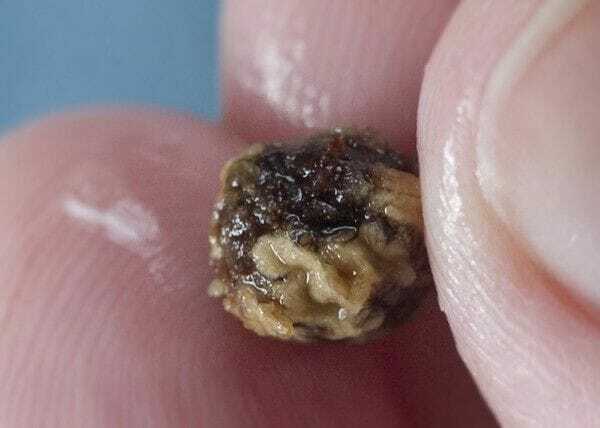 There are 2 articles dedicated to this subject which you may enjoy reading with organic strategies to manage and prevent this problem again. Hope this helps. Let me know how you go this year. Aphids are a natural part of the life cycle in most gardens (just part of the food chain). They often feed on plants that are weak or unhealthy in some way so if you work on your soil by adding plenty of compost, nutrients and organic matter for your plants, this will help keep them in balance. 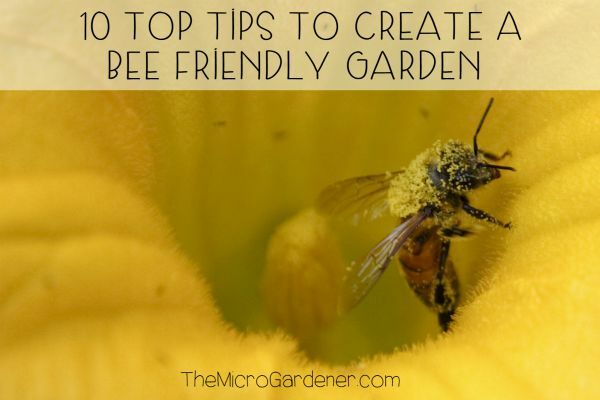 There are many ladybird varieties that feed on aphids and if you avoid using chemicals in your garden, they will arrive to take care of business for you should there be an imbalance in aphid numbers. I see this all the time in my garden. The other day I noticed a dill plant that was struggling due to lack of water, with aphids on the stems/leaves starting to feed. The next day several ladybirds had arrived to enjoy a banquet. The day after that, there were no aphids in sight! Without some aphids, there’s no food for the ladies and they are effectively your best friends (pest patrollers) so allow nature to take care of itself without worrying too much! Hi, been loving my Nasturtiums!! But alas the season is over and they have gone to seed. I’ve picked a rather large bag full of the green seeds and want to know can they be frozen until wanted for eating? Or perhaps dried in a dehydrator? Thanks for all your other tips, I love em!! hahaha! Great to hear you have enjoyed your nasturtiums. It depends on how you want to use them I guess. I wouldn’t recommend freezing them – they will likely lose their viability. If you are going to pickle them whilst green to preserve them, you can do that straight away. If you want to save some for seed for next season, allow the green seeds to dry out naturally then store them in an airtight self seal bag in an envelope in a cool, dark place. They naturally shrivel and go brown on their own so no need to use a dehydrator. You can also grind them up as a tasty pepper if you wish when dry. Hope this helps. I just cant get these seeds to grow. I live in tropical Australia, can anybody help? I must admit here in the sub-tropics, where we have both hot and dry weather AND very wet weather at times, there’s a wide range of conditions for the nasturtium seeds to tolerate. I find my self-sown nasturtium seeds that fall from the plants will germinate after several days of rain in the summer but struggle a bit in very dry weather. If your soil is constantly wet you may be better off trying to grow them in containers if you haven’t already, so you can somewhat control the weather at least until they get started! Here are a few trouble shooting tips in the meantime that may help with germinating Nasturtium seeds successfully – let us all know how you go! 1. Soak in a seaweed solution overnight before planting. 2. Seeds need darkness so make sure they are planted deeply enough. 3. If the seeds are too wet or cold, they can rot. Check and see if they are soft or mushy! If so, this could be the problem. 4. The seeds are best sown where you want them to grow rather than transplanting. Or start them in toilet roll pots or similar biodegradable ‘pots’ that you can plant into the garden once germinated as this system won’t disturb the roots. The pots will break down over time in the soil. 5. Sow in full sun – partial shade. 6. Make sure there is good drainage – otherwise the seeds will rot. 7. 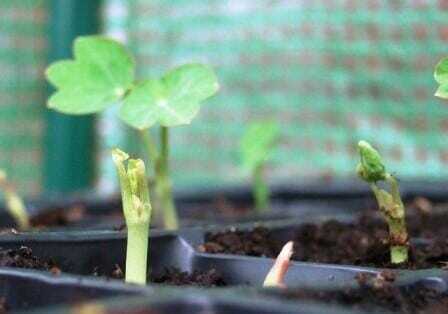 You may find Life on the Balcony’s Seed Scarification Experiment an interesting read on different ways to germinate nasturtiums as part of the Grow Project. Keep us all posted with your results. Thanks Andrea! Glad the info is useful – hope your garden is growing well. I wouldn’t worry about it too much. Mine go through this sometimes too but bounce back. I just think of it as a ‘bad hair day’! They are very resilient. It has been dry and windy here too and if you want to give yours a perk up to encourage new growth, try a foliar spray of seaweed on the leaves and flowers as a tonic. They will take up the trace minerals more quickly than just watering seaweed into the soil. Otherwise you could try a drink of compost tea (make in a bucket of water with a handful of compost, worm castings or manure); or top dress around each plant with a handful of rock dust or minerals – depending on what you have available. I’d also recommend using a moisture meter for your soil. 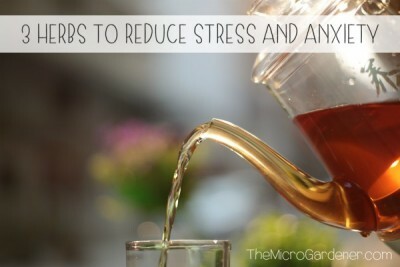 Any plant in stress will show symptoms. If the soil moisture is 10-30%, I’d suggest giving them a drink. Unless there is sufficient moisture they can’t take up the food from the soil to photosynthesize and produce more leaves and flowers. Most of the nasturtiums I have grow in a very shallow soil (mainly created from mushroom compost, minerals and manure) so I suspect it may be lack of moisture (and or exposure to hot dry winds) that may be causing them to thin out. I did add lucerne mulch to my garden beds and this has kept some moisture in the soil during the hot weather. I haven’t fed them again since they went into the beds although have watered from time to time and about monthly with seaweed when I’m doing other parts of the garden. Other than that I just pick and eat. Let me know how you go and if I can help further. I have planted some in a bed and they seem to have dried out with the weather in the last few weeks. I thought it would be covered in more than enough nasturtiums, but it seems my soils at present may be too thin! Oh well, will keep trying!